The Democratic base believes that the FBI and Vladimir Putin just threw America’s election to a racist, authoritarian insult comic who sees the presidency as a profit center — and the Constitution as an afterthought. Senate Democrats spent much of the last year describing Donald Trump in similar terms. But they also spent much of last week voting for Trump’s cabinet nominees. While Democrats do not have the power to block Trump’s cabinet picks, they can delay the confirmation of those nominees and/or deny them the imprimatur of bipartisan support. But the Democratic caucus has declined to exert this power over Trump’s every appointment. There are reasonable arguments for this tactical choice: Opposing all the cabinet picks would dilute the symbolic impact of united opposition to the most odious nominees; both parties have an interest in upholding the norm of deference toward the president on cabinet selections; and some nominees, like James Mattis at Defense, seem like they could be moderating influences on the new administration. But none of these rationales resonated with the most engaged liberal voters. And the spectacle of a supposed progressive firebrand like Elizabeth Warren voting to hand Ben Carson the keys to the Department of Housing and Urban Development — an agency he has no qualifications to run, and whose work he has decried as “communist” — was too much for many lefties to stomach. I still can't believe that Warren voted for Ben Carson. That's wild. Warren was harder on Clinton (see that bankruptcy video in which she distorted Clinton's record) than Ben Carson? But this week, the Democratic leadership is heeding its base’s cries for obstructionism. Apparently, all it takes to get Senate Democrats in a fighting mood is a needlessly cruel (and possibly illegal) executive order, protests at all major American airports, and ostensible acts of perjury from multiple cabinet nominees. On Tuesday, every Democrat on the Senate Finance Committee decided to play hooky: By boycotting votes on Steve Mnuchin’s nomination for Treasury Secretary, and Tom Price’s bid to lead Health and Human Services, Democrats denied their Republican colleagues the quorum required for advancing both nominations. Their reason for doing so was simple: Both Price and Mnuchin appear to have spouted demonstrable falsehoods while testifying to the committee. Everyone agrees that Congressman Price traded medical stocks while working on legislation that could have affected their value (which, in a less kleptocracy-friendly era, might have been disqualifying by itself). And everyone acknowledges that one such trade was a bulk purchase of discounted shares in an Australian biotechnology company — less than a week before Price introduced legislation that would directly benefit that company. But Price testified that he had received no special deal from that Australian firm, explaining that the discounted price was “available to every single individual that was an investor at the time” — a claim that was subsequently contradicted by The Wall Street Journal. In a report published Monday, the paper shows that only a limited number of U.S. investors were privy to that discount. Senate Democrats feel like Price should be asked to account for that. Senate Republicans disagree. “We did not inflict this kind of obstructionism on President Obama,” Pat Toomey, a Republican senator and apparent amnesiac, said at the Senate Finance Committee’s sparsely attended meeting. Meanwhile, after Mnuchin had assured the Senate Finance Committee that his former bank had never used “robo-signing” on mortgage documents, bank records obtained by the Columbus Dispatch proved the opposite. Mr. Mnuchin told me his bank didn't engage in robo-signing, a predatory practice, I found the docs showing he did. Down the hallway, at a meeting of the Senate Judiciary Committee, Democrats tied would-be Attorney General Jeff Sessions to the Trump administration’s executive order barring refugees and immigrants from a list of Muslim-majority countries. Democrats deployed such complaints to drag out debate over Sessions’s nomination, thereby kicking his committee vote to Wednesday. Democrats also tried (unsuccessfully) to delay a vote to advance Betsy DeVos’s nomination for Education Secretary to the full Senate. The push came amid new revelations that DeVos may have plagiarized some of the written testimony she submitted to the committee. Still, Democrats aren’t pursuing a policy of maximum obstruction. Trump’s picks for Energy Secretary, Rick Perry, and Interior secretary, Ryan Zinke, both cleared the Senate Energy and Natural Resources Committee. And Transportation Secretary Elaine Chao was confirmed by the Senate with only six Democrats declining to endorse her appointment. But last week, it looked like Chao’s confirmation vote would be unanimous. 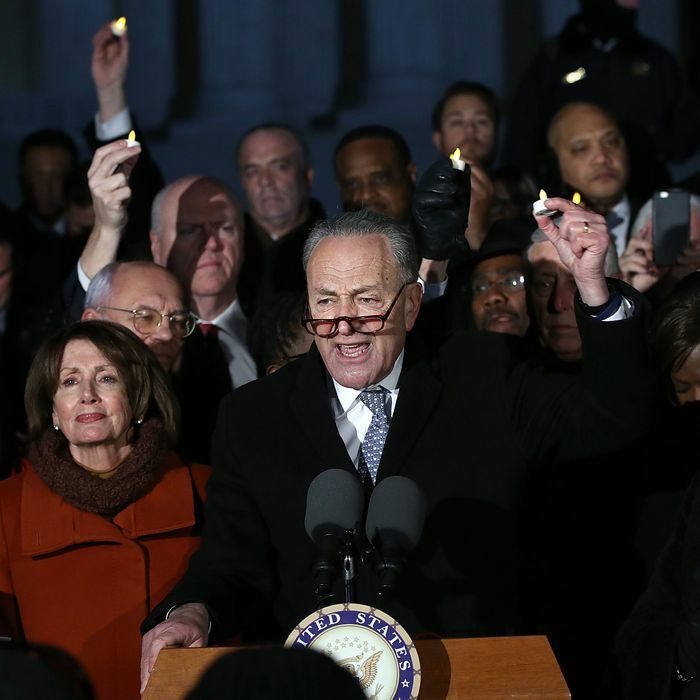 And when you add Tuesday’s acts of obstruction to Monday’s promise of Supreme Court filibuster, it certainly looks like Democrats no longer feel compelled to bring a knife to the next four years of gunfights.